10 key facts about the module. What students say about the module. About Design Thinking and the module. How the module is taught. How the module is assessed. Careers and beyond the module. 1. Design Thinking is the most popular, most successful, approach to innovation in business, arts and social enterprise. 2. A fun, fascinating and transformative journey, all students gain powerful capabilities much in demand in all industries and academic fields, along with experience of modern working practices and workplaces. 3. No previous experience necessary, but your academic and personal experiences are entirely relevant. 4. Learn a combination of creative and analytical methods for successful innovation in business, society and/or academia - meet Warwick grads who have used these techniques for success! 5. Taught in 10 weeks during the Spring Term, at 12 or 15 CATS (depending on your needs). 6. Taught in 10 x 3 hour studio sessions, combining practice, theory, field observations, experts from industry and academia, and creative workshops (Wednesday 10-1pm in 2020, you are welcome to have your lunch during the session, and we have the studio booked until 2.30pm for you to use if you wish). 7. Comprehensive online support, including out-of-hours feedback in our own industry-standard collaboration space. 8. Assessed through a portfolio of short design studies and a reflective essay, developed with continual feedback during the ten weeks, and completed in the first week of April. Designing and developing virtual reality experiences. 10. This module is nicknamed "the platypus module" - to find out why, read to the end of this page. It has really transformed my life. I had an interview for a great job in user experience design. I used what I had learned in the module to answer the interview questions. I got the job. The design challenges were really fun and interesting. It was enjoyable to learn a different writing style too - the portfolio is a brilliant way of doing the assessment. The showcase was an excellent opportunity to pitch ideas in a 'real life' setting outside of the academic context. The Highly Sprung workshop was another highlight. ...the interdisciplinary aspects were fused together . When we had guest speakers leading sessions Rob and Bo were there throughout to provide context and keep the coherence of the module going - making the ten week period feel like one massive interdisciplinary discussion. 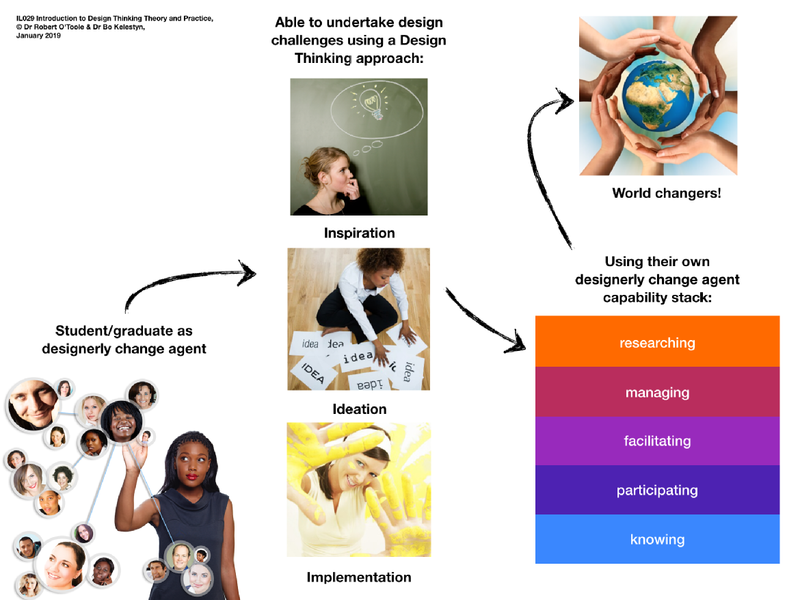 Introduction to Design Thinking welcomes students from every discipline who are committed to becoming effective “change agents” – people who will improve the world through business, academic research, or social innovation, using a “designerly” approach that combines creativity, technology and empathy. Fitting more effectively with the needs, ambitions, values and capabilities of real people – it is a human centric approach. Sticking in use, being emotionally durable and environmentally sustainable – value-driven innovation, with a strong ethical basis. Spreading far and wide, to many people and places, so as to maximise the value of innovations – socially-conscious innovation, inclusive by default. Growing capabilities for further enhancement and innovation – Design Thinking is developmental by default. The emphasis of the module is on fun, experience, reflection, participation, and most importantly, what we call "iterating with people and design prototypes" - together we create lots of ideas, from simple diagrams and stories, through lo-fidelity prototypes, and sometimes, all the way up to hi-fidelity prototypes. The aim is always to do things that we can learn from: learn about the world, people, culture, technologies, problems, and most importantly, ourselves as designers. We do this as a team. The module begins with a collective exploration of how we fit together as a team (the platypus, see below). We take on a series of increasingly complex design studies, learning about design theory and methods as we work. The three hour long studio-based sessions are a mix of show-and-tell, creative activities, analysis, practice, field studies (around the university and beyond), and short interactive lectures. We use all of the best technologies available. Between sessions, you will have short design challenges to work on. We give you instant feedback on these (online), to help you to develop your skills in observing designs, describing, and as we move towards the bigger design challenges, creating designs. Along the way we have sessions and videoconferences with experts from a range of fields (Bo and Robert are present for all of these). This includes a "building creative confidence" workshop with Highly Sprung, and a formal methods analysis workshop with Graeme Knowles of WMG. The module is diverse, personal, and always fun. During the module, students complete and get feedback on a series of 300-600 word design studies (responses to design challenges), created individually and in small teams. Studies are presented in an online professional portfolio, along with a reflective essay (completed in the Easter vacation). This may consist of text, photos, diagrams, video and audio – creative responses are welcome. For all students, effective use of audio, video, diagrams and photos can replace up to 50% of the word count in the design studies if you wish. Even before week 7 of the module in 2019, students were getting excellent jobs and internships helped by what they had learned on the module. We also provide advice on careers throughout the module, and you will get to meet successful people from a broad range of industries and academic disciplines. We welcome students into the Educational Design Thinkers at Warwick network. There are many voluntary and paid opportunities at Warwick for students to get involved in design and innovation. In the classic book on Design Thinking, Change by Design (2009), Tim Brown describes the idea of a "platypus team", an unusual combination of people with quite different backgrounds, ineterests and skills. To a conventional management approach, this should not work, indeed might be impossible - just as Victorian zoologists thought that the platypus (an egg laying mammal with a beak, flippers and a venomous spine) was impossible. But for Design Thinking, it is essential (the unusual combination, not the venemous spine). Teaching Grid, Library, Floor 2.